Core Moto Full brake line kit. 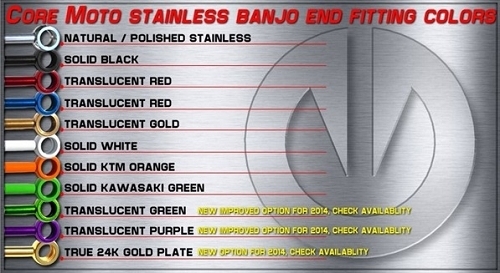 Front and rear lines with all bolts needed anodized to match the banjo color you specify. In our opinion this is the kit to get and that's why you'll see it on our shop bike on the main page! Core Moto quality is some of the best we have ever seen. 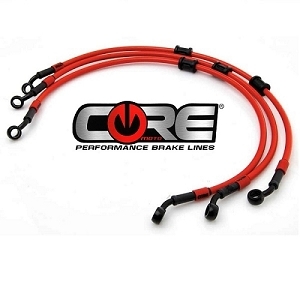 Core Moto stainless steel brake lines are made using only top grade materials and construction. Each line features an inner core Teflon® hose wrapped tightly in a cold drawn high tinsel 32 strand stainless steel braid. All lines are then coated with a flexible PVC outer shell for superior strength, corrosion resistance and abrasion protection. 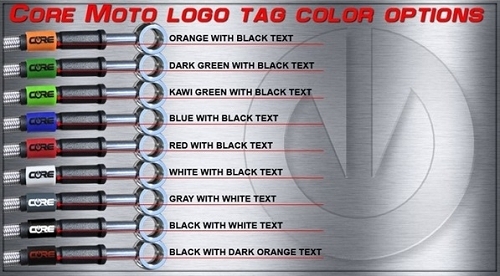 Available in 19 color options. Line material from other companies may look the same but the real quality lies in the chemistry and composition of the materials being used. Our Teflon® core stainless steel lines can be bent 18,000,000 times before rupture compared to only 750,000 bends of the standard PTFE used by some other companies. Most companies only test assemblies up to to 5,000 psi. We choose to use line material that out performs industry standards.